Maybe there’s an 80 year rule in history: for 80 years memories of a war, a prolonged disaster, a political cul-de-sac remain vivid enough to affect the decisions people make collectively. That might explain the re-Balkanization of the Balkans in the 1990s since 80 years after the assassination of Archduke Ferdinand in Sarajevo the region erupted into the bloody conflict which saw the dismemberment of the former Yugoslavia. What had led to the events which touched off the First World War had faded from common memory. And now we have the finance mess in the US. Next year it will be 80 years after the Great Crash of 1929, and the people who remember are growing fewer. Lee and I were born long after it, but the Great Depression which followed marked our parents significantly. How they reacted was quite different—his parents were extremely frugal while mine spent whatever came their way—but the long shadow of those years of penury were part of our family history. Maybe that is why the possible consequences of the Wall Street meltdown seem to weigh so lightly on some Congressmen and –women. Certainly the 67 per cent of the Republicans who voted against the bail-out package are either blinded by ideology or are so removed from the economic stresses of ordinary life that they just don’t get what is happening. The Democrats who opposed seem to base their opposition on righteous concern over the idea of rewarding the people who got us into the mess. That I can understand—applaud even—yet somehow a way out of this mess must be found. The trouble with being away is that you miss things. Not only did the whole world’s financial system nearly go up in smoke last week when I was gallivanting around, Margaret Atwood had some terrific things to say about the value of culture and the way Canadians have been led astray by the conservatives. Her first foray was an op-ed piece in The Globe and Mail, entitled "Mr. Harper is wrong: There's more to the arts than a bunch of rich people at galas whining about their grants”. You’re not likely to find it through the usual sources because, it seems, Ms. Atwood is a rare person who can write for the Globe and not be required to sign over electronic rights. Nevertheless the piece was pirated, and is of such value that I’m going include a link to it even though I hate electronic rights grabs. She also spoke at length with Sinclair Stewart in Saturday’s Globe. Part of this is promotion for the Massey lectures she will give in November and part is a general reflection on where we are economically, given these difficult times. Stewart asked her: "Are we better off in Canada, or should we be worrying as well?" And Stephen Harper? What do you bet he doesn't even have a credit card? 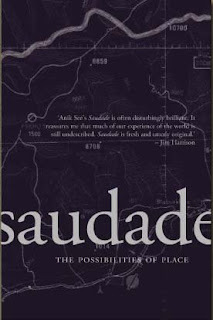 Anik See's book Saudade (Coach House Press) was also launched at the three events I was part of this week. She's a charming, tough young woman who has written a very interesting book which is part travel journal, part memoir. Over the last 15 years she's bicycled all over the world, and her observations and sensibility combine to make most interesting reading. Now based in Amsterdam, she had some great stories to complement my own ideas about how cities should be organized. Amsterdam, she says, was not the city full of bicycles that it is today, but the result of conscious choices made a couple of decades ago. The city was being choked by cars, but instead of building more roads, the decision was made to favour the bike. The result--after years of bike-riding education for kids, adults and drivers--is a place where rush hour is quiet except for the whoosh of bikes passing with the occasional bike bell ringing. Gives us hope for here, I think. To get to Toronto Island you take a ferry from downtown, the way you can take a ferry to get toNorth Vancouver from downtown Vancouver. After walking through downtown Ottawa this afternoon, I began to wonder if ferries might make transport easier between Ottawa and Gatineau. Lines of buses and masses of cars waited to cross the bridges, and the people I spoke to said there is much discussion about the need for a new bridge. Could ferries from strategic points be an easier answer? We're off to Ottawa this morning (and not Paris, as the picture might lead you to believe.) Would like to think that the visit might help change the government might, that's not very likely. Anik See and I will be reading and talking and all that tonight beginning at 7 pm. at Nicolas Hoare Books, 419 Sussex Drive. Do you think we should go over and knock on the door at 24 Sussex? But then Steve will be on the road, too, won't he? The US Financial Crisis: Hey, Wait a Minute, You’re Going to Give the Guys Who Got Us into This Mess Complete Control? "Cash for Trash" is the title of Paul Krugman’s most recent column, and Naomi Klein is calling for resistance to the latest attempt to use a crisis in the interests of Disaster Capitalism. There are few who doubt that massive efforts are needed to right the listing financial ship, but what is being proposed goes far further that. “If the government is going to provide capital to financial firms, it should get what people who provide capital are entitled to — a share in ownership, so that all the gains if the rescue plan works don’t go to the people who made the mess in the first place,” Krugman writes. Let’s hope so. It may not be time to go to the barricades, but it sure is time to write, e-mail and protest. "So, did you walk here?" the interviewer asked me when we started out talking about The Walkable City at Radio Canada International. I had to laugh because actually I took the bus and Metro, although I could add that I planned on walking home. The interview and the errands I ran on the way back account for this rather late post. But this is a day when partisans of muscle-powered transit should be pleased. Not only has the city of Montreal just unveiled the first rental bikes--the Bixis--that will be available at selected places around town, but it's Carless Day downtown. The former intiative is far more serious than the latter: a similar program in Paris has proved extremely successful, and there's no reason why Bixis should be very popular here. I was astounded by the flotilla of cyclists this morning: obviously people of all ages are cycling now. The latter is more public relations exercise than serious attempt to make Montreal a place where you don't need a car, but perhaps even this kind of hoopla is necessary. Whatever, I'll pass along the link when the RCI program airs. In the meantime, it's another gorgeous day for walking. The first copies of The Walkable City: From Haussmann's Boulevards to Jane Jacobs' Streets and Beyond arrived from the printer on Thursday, to my great delight. Since a good portion of the book talks about Paris, and in particular the Fifth and Thirteenth districts, it seems only fitting to include a couple of pictures today. The first was taken on a Saturday morning last May when Mouffetard was filling up with shoppers and locals enjoying a nice spring day. 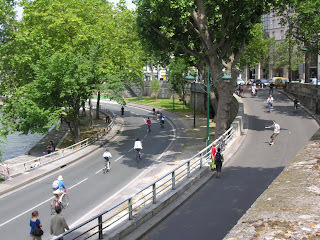 The second was taken the next day, Sunday, when the high speed roadway along the Seine is turned over to non-motorized traffic. 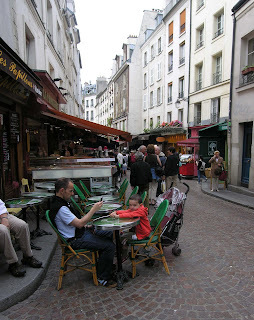 If there ever was a walkable city Paris is it! What great memories we have of it, too--just the thing to pull out and enjoy when times are tough. This morning presents the kind of fall weather that makes the heat and sog of summer worth living through. Clear sky, green grass, an abundance of late season flowers, brisk temperatures and the first leaves turning red and yellow. It looks like a day to take one’s eyes off of the woes of the world. And they are many. I see, looking over my last posts, that I’ve been concentrating on them but I think it’s time to look at something else. That is: the way that moments from the past can carry us through difficult hours. How many happy times will any one person with average luck have in a life time? I have no idea, but I do know that if you can store them up and bring them out when times are rough, you will often find the courage to face life. Not to do so is to lay the ground work for despair, and when despair settles in it can paralyze. And memories--frequently of fleeting events, periods of time that would be measured in seconds on the clock--last longer than one would ever imagine. As Everett Sloane said in Citizen Kane: "A fellow will remember a lot of things you wouldn't think he'd remember. You take me. One day, back in 1896, I was crossing over to Jersey on the ferry, and as we pulled out, there was another ferry pulling in, and on it there was a girl waiting to get off. A white dress she had on. She was carrying a white parasol. I only saw her for one second. She didn't see me at all, but I'll bet a month hasn't gone by since, that I haven't thought of that girl." So today I am going to try to store up the feeling of this lovely morning. I’ll add it to other moments worth remembering, among them an afternoon in Golden Gate Park when Lee and I were newly in love, the star-filled night sky in Tanzania, many dinners with our children and their conjoints, and a call from my niece saying she thought something I wrote would have pleased her mother/my sister. There are many others: as I sit here trying to decide which ones to mention—what about the night that Thomas Mulcair won for the NPD in Outremont, proving what I’d been saying about the win-ability of the riding for 20 years had been right?--I realize that they add up to fuel to keep me going for the long run--and in the long run. The Gazette grudgingly admits today that the NDP is doing well in Quebec, and that Jack Layton has become the chou-chou of urban Francophone voters. Glad the newspaper is finally realizing what is going on. After a number of weeks telephoning for NDP candidates, it looks to me that the vote here is very volatile. People are fed up with the Liberals and the Bloc and are willing to vote for an alternative, and the NDP is the most credible one. The support that Thomas Mulcair had when he won a by election in Outremont a year ago continues to be strong. Anne Lagacé Dowson's campaign in Westmount-Ville Marie is going great guns too, despite the fact that some people who were working in her aborted by election campaign were from outside the riding, and now want to work in their home ridings too. Further to the "socialization" of AIG: Le Devoir has a great cartoon today. Under the headline "George W. Bush, the Socialist," Garnotte has put a drawing of Dubya in a Mao suit talking on the telephone to the Chinese president. "Can you give me some tips on how to run a big state-owned company," he's saying. AIG Bail-Out: Disaster Capitalism or a Chance to Force Insurance Companies to Support Universal Health Insurance in the US? Just checked Naomi Klein’s web site to see if she has made any comment about the bail-out of insurance giant AIG, and it seems so far she hasn’t. The rescue plan would seem to be a brilliant example of the “disaster capitalism” that she has been talking and writing about for the last few years. There was no way that the US government could let AIG go bankrupt, since it was so deeply involved in he US economy. But the implications for the future are profound. This is socialism for the rich. Supposedly the US can’t afford universal Medicare (and the right wing here is constantly saying the we can’t in Canada either) but it can afford to rescue companies that made very bad decisions. Okay, so far. I understand that (and even have a stake in seeing that AIG stays solvent, having some money invested in AIG Canada.) But will there be a quid pro quo? That is, will the US government step in with stronger measures to regulate the financial industries? So far McCain makes clear it wouldn’t under his administration, and Obama has said much interesting either. The US insurance industry is probably the biggest roadblock to universal Medicare in that country. But what if a new Obama administration said to AIG: we got you out of a mess, now you have to help get the country of the current health care insurance crisis. You come onside, and lobby your corner, and let’s come up with a plan that insures everybody, has simple administration (single-payer would be best) and that you will lobby for enthusiastically. That would be using a crisis for a good cause, the reverse of “disaster capitalism.” Are you listening, Mr. Obama? Ayn Rand’s Anthem is the 38th book that Yann Martel has sent to Prime Minister Stephen Harper in his one-man campaign to provide a little interesting and helpful reading. The project began when Harper appeared harried during a Canada Council for the Arts event in which Martel participated: the Man Booker Prize winner thought a short, thought-provoking book sent every two weeks would give the PM a little “stillness” for reflection just before he went to sleep. Martel’s choice before Anthem was Jonathan Swift’s A Modest Proposal, so it probably should be no surprise that Martel has expanded this fortnight’s offering into a suggestion that Canada set up a Prime Ministers’ Reading List. “(W)e expect a Prime Minister to have a fair knowledge of the history and geography of Canada, to know something about economics and public administration, about current events and foreign affairs, the financial assets of a Prime Minister are accountable to us, so why shouldn’t his or her imaginative assets also be accountable?” Martel writes. Of course, setting up the list, administering it and checking to see that the PM actually does the reading would raise a whole lot of problems, but Martel—as Swift did in his comic and shocking treatise on how to solve the problems of poverty in Ireland—answers objections to his proposal. He admits that Harper might feel like shouting “I have no time for this nonsense, ” But, Martel continues, "as I said to you in my very first letter, there is a space next to every bed where a book can be lying in wait. And I ask you again: what is your mind made of?" It is highly unlikely that Martel will get an answer: he got one response to his generous gifts. A short letter of acknowledgement was sent by one of the PM’s assistants. But since then there has been silence. For a man who is so smart, Harper certainly doesn’t know anything about politeness—nor does he appreciate the wisdom and pleasure that literature can bring all of us, it seems more and more certain. But I’ll lay you odds that he’s read Anthem already. As Martel notes: "Rand appeals mostly to two disparate groups of readers: adolescents in the throes of carving out their individuality, and right-wing American capitalists bent on making and keeping too much money.” I’m sure Harper was the former and its clear he’s the lackey of the latter. One of the things that I found hard to do as we worked down to the wire on The Walkable City a couple of weeks ago was hedge my bets in discussions about what is going to happen next on the world stage. A large part of the book talks about how the guaranteed mortgage system set up in Canada and the US after World War II and the desire of ordinary folks all over the world to own a place they can call their own affects the way our cities are structured. That is easy to see, and we’re going to have to live with what we’ve got for a long time. But what wasn't clear and still isn’t clear is the impact of the continuing fall-out from very bad decisions made to open up the financial system during the last 15 years or so. Paul Krugman in The New York Times today ends his column about the collapse of Lehmann and the faltering of Merrill Lynch with “yikes!” I can think of several other epithets. The Texas gulf coast is currently surveying the damage of Hurricane Ike which reminds me of Naomi Klein’s eloquent warning about “disaster capitalism” in The Shock Doctrine. In times like these when so much seems to be foundering, the doctrine right—what Krugman calls “movement conservatives”—are ready with quick answers that we may accept, because we have no others handy. Now is the time to think a bit, not act rashly. Among other things, this means not being taken in by the bling surrounding Sarah Pallin, or the carefully selected actions of Stephen Harper which are aimed at wooing just enough swing voters to give him a majority. And it means not being able to be categorical in providing a formula for the future our cities. I think The Walkable City as it stands now—just about ready to come off the presses—provides enough substance to help us make the decisions we must make, and offers good suggestions for what we must do. The first copies of my new book The Walkable City: Haussmann's Boulevards to Jane Jacobs' Streets and Beyond are supposed to be ready on Monday, and things are shaping up for a mini-tour the week of September 22. 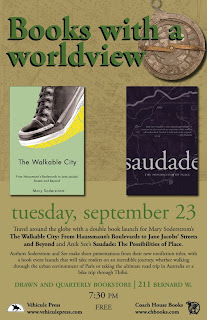 Along with Annik See, whose travel memoir Saudade is being published this fall by Coach House Press, I'll be giving short presentations in three books stores. We'll also have time to answer questions about the books. TYPE Books, 883 Queen Street West, in the middle of another walkable neighborhood. Ways to Get Rid of Harper: Voting NDP Straight Up, or in a Vote Swap? Yesterday I had the pleasure of seeing an NDP welcome for Jack Layton spill out of the Westmount-Ville Marie election office and take over Sherbrooke street. The election tour bus—painted with big NDP graphics and driven by a smartly dressed female driver—attracted quite a bit of attention, and the crowd on the sidewalk straining to get a glimpse of Layton, Anne Lagacé Dawson, Thomas Mulcair and other NDP candidates was clearly upbeat. This election is an important one, and I think people in Quebec and elsewhere are looking around for some way to put the country back on track. As I’ve said before, unhappy Liberals should vote NDP because that is where principled positions and solid leadership is. An attempt to start a “swap vote” campaign is also an interesting development. Having voted for losing candidates in many, many elections for reasons of principle, I’m quite comfortable usually with voting my heart and not strategically. But in this important election, the Anti-Harper Vote Swap Facebook group bears watching. This morning it has 675 members, and aims to match up voters who want to stop the Harper Conservatives. Under it a Liberal living in a riding where the NDP has a good chance to win would agree to vote NDP in exchange for a NDPer voting Liberal in a riding where the Liberal is in a tight, but winnable, race against a Conservative. Check the group out. So far I’ve done two of the four book discussions about Doris Lessing’s The Golden Network I’m scheduled to lead this fall, and two things seem clear: she has never stopped mining her life for her art, and she goes overboard on the projects she particularly holds dear. At around 600 pages (depending on the edition) The Golden Notebook is considered by many critics to be her masterwork. It’s a feminist milestone to some, an eloquent description of the grand malaise that settled on the Left in the 1950s, and/or an account of a woman coming apart in a world in disarray. It also is hard to get into, confusing at times, and obsessed with detail. Among my bookies, only about a third had persevered to the end, although many of them had read other books by Lessing with pleasure. As they talked about them, it became clear that she reworked many of the incidents and reflections found in The Golden Notebook in other works, producing stories that are much more accessible—and I would say interesting. Of course one of the obsessions of Anna in The Golden Notebook is the way a writer can tell the truth. As the book begins, Anna is completely dissatisfied with her early novel about Africa, and the notebooks she keeps are an attempt to get closer to The Truth, whatever that is. Hmm, that may be a thing to discuss the next time The Golden Notebook is on the program. Certainly I’m going to tell the two groups who have discussions scheduled (in October and November) that members might like to read something else by her if they find The Golden Notebooks tough going. They're likely to find many of the same concerns, characters and events, but recounted differently. After all, as I keep telling myself, it's not the story that matters, it's how you tell the story. There have been a flurry of stories about the future of the planned super hospital in Montreal which is supposed to combine major parts of the Université de Montréal’s teaching hospitals (the Centre hospitalier de l’Université de Montréal, or CHUM.) In the works for 15 years, the new hospital's site in downtown Montreal was picked a good four or five years ago, but the project is advancing very slowly. Several doctors’ groups have begun again to argue about whether the site chosen is a good one. The latest news reported in La Presse and Le Devoir is that the public hospital will be surrounded by private clinics which will "compete" with the public facility or 'complement" it, take your pick. Presumably the private clinics will be part of the universal health care system we have here. That is, the doctors and staff will bill Quebec Medicare for most services, as is often currently the case for services like radiology. Doing this is considered not a breach in regulations governing the health care system. But these doctors affiliated with these clinics often propose treatments not covered by the health plan—“advanced” lenses after cataract surgery are frequently pushed—which of course means more money for them. Almost certainly this would happen in the CHUM case, but what is even more troubling is that several former government members, including the last minister of health Philippe Couillard, have a financial stake in the new clinics. The current provincial government should crack down this, but is highly unlikely to do so. Increased privatisation of the health system appears to have been on its agenda all along, even though a report calling for more clinics was whisked away last winter as soon as it was presented. The tactic seems to have been: we won’t talk about it now, and then we’ll go ahead and do it. Shame, shame! as the official record of House of Commons’ debates would say. An Angus Reid poll on the weekend said that health care is the number one preoccupation of Canadians at large as they go into a federal election. It is time to come out strongly in defense of our generally excellent, single-payer, universal health care system—and then, once decent folk are elected federally and provincially, to act to strengthen it. Power outage this morning, so no work until now! I actually was forced to write with a pen since I've got stuff due today. What a strange feeling! I have a cramp in my shoulder from holding my arm at an angle that I'm not used to. Then of course, the Hydro Quebec guy came by to read the meter. I think he was chastized by several of the neighbors who weren't pleased by the lengthy interruption in service. Poor guy, it wasn't his fault. But the temptation is always to shoot the messenger, or the equivalent. Our relative paralysis in the absence of electricity is not something to take lightly, however. In Quebec nearly all our power comes from hydro-electricity, which in some respects protects us from the problems of petroleum-generated electricity. Has the increasing cost of petroleum shown up in the cost of electricity from oil-fired plants? A file to be followed, for sure. The fall season of book discussion groups starts today for me. One of my pleasures of the past few years has been being invited to lead book discussions in various libraries. This evening I meet a group in the Montreal suburb of Pierrefonds to talk about Doris Lessing’s The Golden Notebook, and tomorrow I lead a causerie littéraire on her Carnet d’or. The book is much longer than I remembered, and I re-reading it these past couple of weeks, I found myself leaving the English version downstairs and the French version upstairs, switching back and forth depending upon where I settled down to read. That meant I could compare the original and the translation, and still make headway in a book that is challenging if you take it seriously. Tomorrow afternoon the group consists of some elderly ladies living in the Résidence Outremont who have been reading from a group of biographies of queens that the Outremont library put at their disposition. I’ve dipped into most of the choices, and found them very interesting. Since this is the first time, I’ve animated this kind of discussion I found myself trying to figure out how to get the ladies talking as I walked along this morning. Should be an interesting experience. On Wednesday, it’s the Atwater Library’s turn, and the book will be the amazing Impac Dublin prize winner De Niro’s Game by Rawi Hage, while on Thursday it’s out to another suburb, Kirkland, to chat about Muriel Barbery’s L’élégance du hérisson. All are good books, dealing with a wide variety of human concerns. As such, they provide a very rich background to the current political ferment here and the US. That, of course, is one of the reasons to read fiction: the stories resonate in our lives, allow us to reflect on what is happening and—sometimes—to find a way, at least temporarily, out of the impasses we find ourselves in. 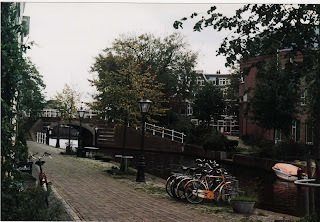 The first time I saw a dignified person of certain age pumping along during rush hour on a bicycle was when we visited The Hague in 2000 where Elin was studying. The streets were full of people on bikes of all ages, shapes and sizes, including men in military uniforms and dowagers with shopping baskets full of good things to eat. How amazing, I thought. Well, I said to myself, maybe those old folks had been riding continually since they were kids, so they never had a chance to get out of shape. That would never happen in North America, though, I added to myself. It would be overstating it to say that the middle-aged in Montreal have taken to bikes in large numbers, but without a doubt bike riding has increased exponentially in the last three years, even among aging Baby Boomers. Two sets of polls show the Conservatives close to getting a majority, and running neck and neck with the separatist Bloc Québécois in Quebec. The Liberals (more centrist than left wing) usually win big here and often do so in Ontario, but are clearly in trouble. After several weeks of phoning for Anne Lagacé Dowson, the NDP candidate in one of the four by elections that will be rolled into the general election, it seems to me that unhappy Liberals are indeed looking for candidates other than Liberal ones to vote for. Westmount-Ville Marie is considered a safe Liberal riding, but I happened upon many people who say they’re fed up. Some of them told me they are voting Conservative, and some of them are clearly at a loss. One woman said that she and her husband are going on a cruise to avoid the whole question. While some Liberals are clearly fiscal conservatives in the Canadian context (and note that both liberal and conservative have quite different meanings—much more to the left—than in the US) others really believe in center left principles. The NDP could pick up their support all over the country. With a well run campaign and a little luck Jack Layton and a team of good candidates will be the spoiler in this election. As for me, well, I was going to get out the vote this weekend and on the expected by election day of September 8. But I’ll take a couple of days to catch up on other work and then do what I can do to help win this election for the NDP--and the country. To give the devil his due, I should report that Radio Canada is pulling out all the stops to celebrate the 75th anniversary of the Montreal Symphony Orchestra: live broadcast of a concert on Espace Musique, television and the net plus a program giving highlights of the orchestra's history. Check it out at 8 p.m. EDT here. No Smog in Montreal This Summer: Because of Rain or Transport Changes? The Montréal region recorded no smog alerts during this past summer, compared to about a dozen the year before, Radio Canada reported this morning. All that rain and wind, said the spokesman for Environnement Canada. Pollutants didn’t have a chance to collect, stagnate and turn into the nasty pall that is so unhealthy, he said. As I walked along this morning, watching the flotilla of bicycles going to work and school, I wondered if changes in transportation habits might also have something to do with it. Montréal’s public transit agency (the Société de transport de Montréal or STM) just reported an increase in ridership of 4 per cent between January and June, while friends who hadn’t been in Montreal for a couple of years this summer were bowled away the number of bikes on the streets. All to the good, I say. Of course, it smelled at mid day yesterday of ozone and hydrocarbons the way remember from my Southern California childhood. But it didn’t last, and even though a heat haze covers the city this morning, we’re told it’s not smog. And the offer made by the public transport agency for the communities just north of Montreal island (the Société de transports de Laval, or STL) has run out: it promised a reduction in bus fares from $2.50 to $1 every day there was a smog alert between June 2 and September 2. A nice offer, but one it seems it didn’t have to honour. Some real music in the air! Just as the CBC’s Radio Two was starting its dumbed-down programming Elin dropped by between rehearsals for supper the other night. Today she will the recording a program of Henry Purcell’s music for a disc Les Voix Humaines will release in honour of the 250th anniversary of his birth in 1659, and she was headed to Suzy Napper’s to work on that music. Just before she’d had a long lesson with Margaret Little, who is directing her work on a doctorate in performance at the Université de Montréal. Now, we’re always glad to see her but this time she had a real treat to show us: two viola da gambas that she’ll play in the two programs in addition to the French-inspired instrument she usually plays. She’ll give the first of four recitals required by the doctorate program next week, and for that she’ll use a reproduction of a 17th century Italian instrument that she has on loan. The music featured will be that of Orazio Bassani, a gambist/composer/improviser of 16th century Ferrari. Elin is particularly interested in the way gambists (and other instrumentalists) of the time used improvisation, much like jazz musicians do today. She says it seems only fitting to use an Italian style instrument to play the music. For the Purcell recording, though, she gets to play the real thing. She had with her a tenor viol made in the 17th century in England—a instrument with a glorious sound and a work of art in its own right. Les Voix Humaines have been able to borrow three period instruments from the University of Toronto for the Purcell which is shaping up to a marvelous musical event. More details about it later. It is particularly a pleasure to have such good music in prospect when Radio Two after 3 p.m. has become such a waste land. 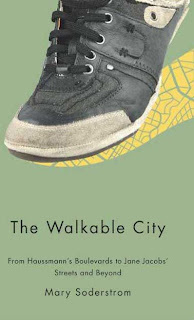 Yesterday morning I found this in my in-box: a revised cover for The Walkable City: From Haussmann's Boulevards to Jane Jacobs' Streets and Beyond. If you follow this link to the Véhicule Press website you'll see the old one, but this is much punchier. Amazing what a little tweaking can do! The book will be launched here in Montreal September 23, in Ottawa, September 24, and in Toronto, September 25--but more about that later. What is really interesting is a number of new figures on increases in the use of public transportation in Canada. Le Devoir reports this morning that a Strategic Studies report shows that more than 80 per cent of Canadians are thinking of switching to public transportation, while figures released last week by the Société de transports de Montréal (STM) say that ridership increased by 4 per cent between January and June this year. Making our cities more walkable and increasing public transport is going to be absolutely essential in the future. Three are worth mentioning: The Tour from Serbia, Nobody to Watch over Me from Japan and Todos Estamos Invitados from Spain. I thought the first was the best: it is a comedy (?) that takes place in December 1993 when a theatre troupe from Belgrade finds itself on the front in that fratricidal war. The second is concerned with what happens to the family of a presumed child killer in Japan—a media circus, an innocent younger sister hounded, a cop who feel guilty about not protecting another child. The last takes place in the Basque country where a professor who denounces terrorism is threatened by ETA stalwarts. All are worth seeing for the window they offer on their respective societies. One theme recurs however: how group and societal pressure can stir up hatred among and toward people who initially at first have clean hands. This is something I’ve always been concerned about (as have many, many people) and to which I find myself returning as I try to make sense of the world, as well as decide what project to take on next.